This morning as I awoke, I saw heavy snow falling. I love snow. In a normal day I would have not minded having snow falling but since I was to do a cooking class at noon, I was hoping that the snow would not stayed… luckily it did not, and the cooking class took place. But this snow and this nasty weather just made me want to stay in the comfort of my home this afternoon to play in my kitchen. 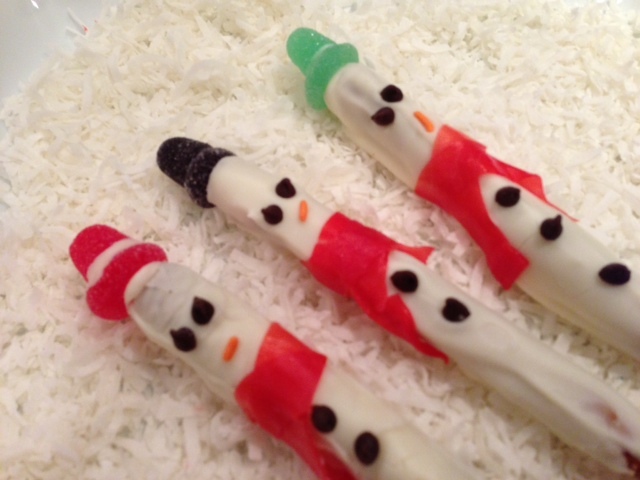 Since I was not going to be able to make snowman in real life, I decided I would make them inside my home;-) and made those yummy snowman pretzels. a bag of pretzel sticks. Place the chocolate in a microwave safe container and cook the chocolate for 90 seconds. Stir. Cook for another 30 seconds, stir and repeat this process until the chocolate is perfectly melted and liquid. Dunk each pretzel stick into the chocolate and place the chocolate covered pretzels on a silpat. Quickly place 2 mini chocolate chips for the eyes, 1 orange sprinkle for the nose, and 2 for the buttons of the coat. When the chocolate is completely cold. Cut with scissors a small string to make the scarf. Take a gum drop of your choice. Cut one hand and with your thumb, push the small slice down to make it flat and larger. Place it on the end of the pretzel stick and glue it with a bit of chocolate. Attach the other part of the gum drop with a bit of chocolate. Et voila!!! Make as many as you want….